We're bouncing around the office with excitement and anticipation to launch our newest campaign, 'The Sisterhood of the Travelling Shorts'. This is something special that we have been working on for months and months and it is just such an amazing feeling to finally share it with you all. This campaign has such a huge place in our hearts and more than anything we'd like for it to succeed so we can raise as much money as possible for those who are battling breast cancer. 100% of the profits gained from the sales of these cute little pink shorts will be donated to the National Breast Cancer Foundation and you can purchase them from www.casperandpearl.com for $60 at 6:00pm tonight! 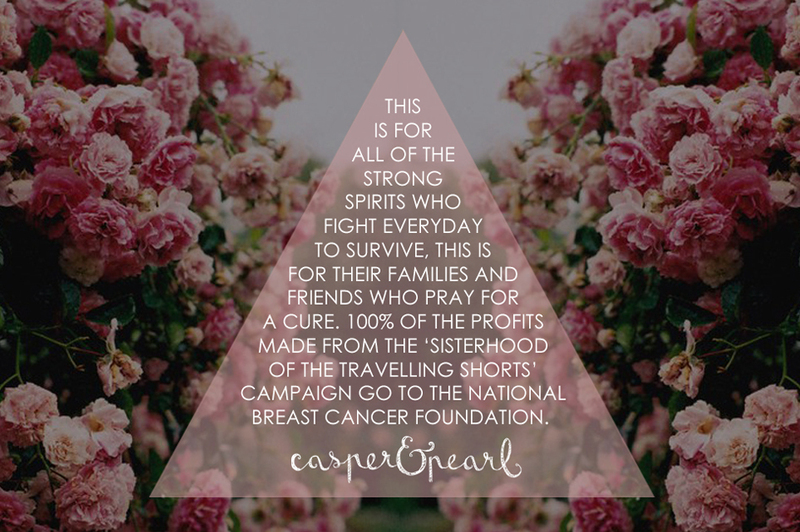 A casper&pearl girl cares about the world around her and lives passionately! This is just such a lovely idea and not enough places are embracing it! Good on you guys, got me feeling all warm and fuzzy. Beautiful pink shorts! I like! Oh man those shorts are absolutely adorable and I tip my hat to you for your philanthropic efforts. That's a really cool thing for you guys to be doing.